Located at the Eau Palm Beach Resort & Spa, Angle is a culinary experience for the senses showcasing contemporary cuisine and farm-to-table seasonal offerings. The warm and inviting space has a sleek and urbane decor with chocolate velvet walls, glowing candlelight, reflective mirrors, and an underlit onyx and amber “Chef’s Table” offering a true foodie indulgence in the center of the dining room. 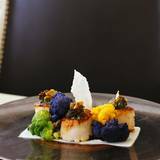 The Angle ambiance is rivaled only by its culinary team compromised of Chef de Cuisine Manlee Siu, and Sommelier, Levin Glane. If you’d prefer to talk now, please call us at (855) 404-7782.